Today, at devLink 2014, my last session of the day is “Practical Machine Learning – Predicting Things” by Seth Juarez. In his presentation, Seth talks about machine learning and his machine learning library, numl. The session is very entertaining and I learn a lot from it. I have played with numl earlier this year by writing short F# script. After the session today, I just want to look at it again and see if my short F# script could still be run on OSX with Xamarin/Mono. 1. 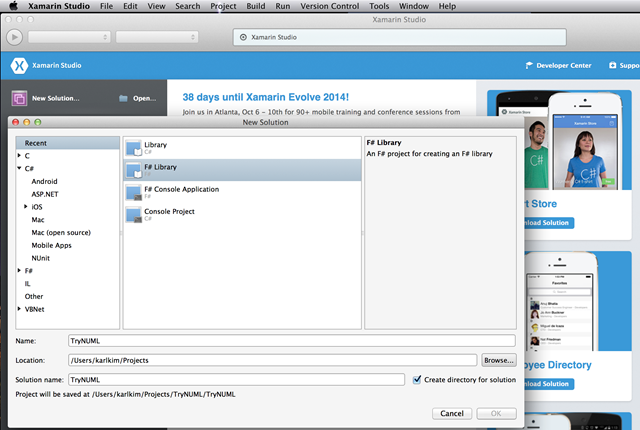 Open Xamarin Studio and create a F# Library project. 2. 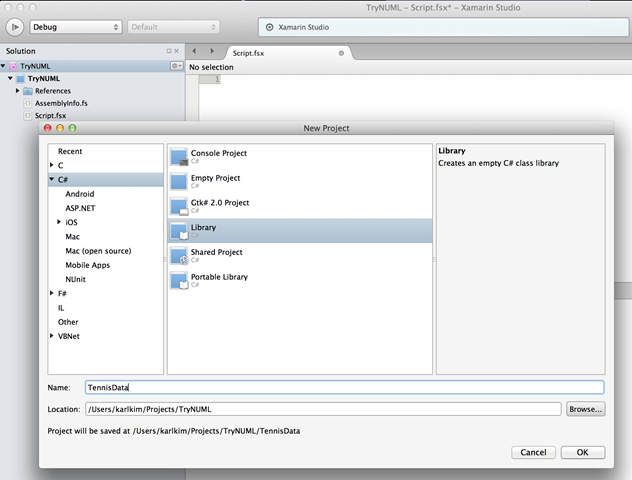 Create C# Library project and add numl NuGet package to C# library. 3. 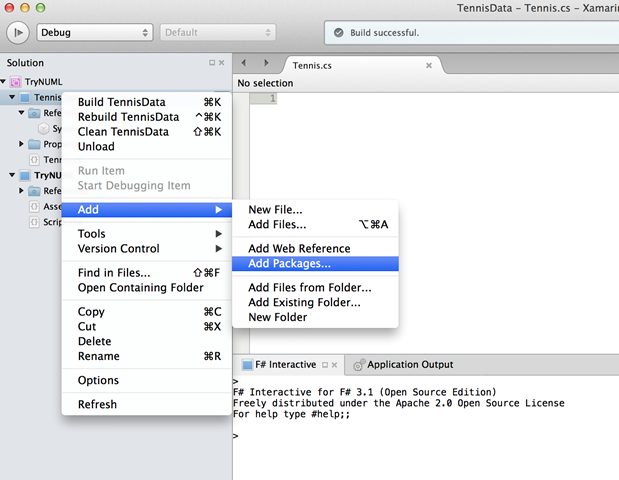 Add Tennis class and data set from here or here. 4. 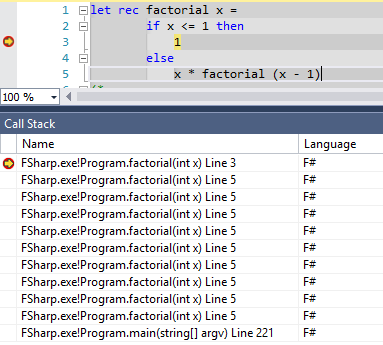 In F# Library project, I copy my existing F# code, adjust reference locations a little bit, and run it. Everything seems to work flawlessly! That’s it. 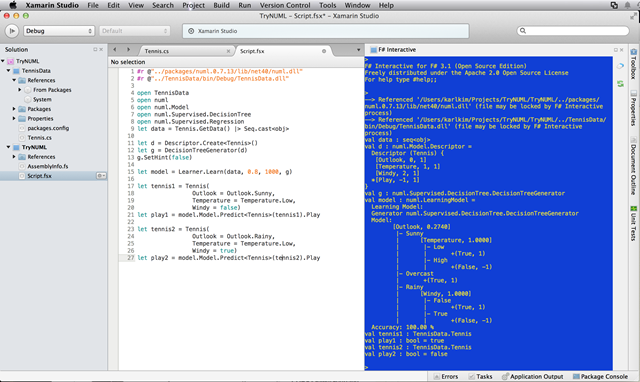 It’s good to learn that my existing F# code can run smoothly on OSX. Hopefully, I’ll have sometime playing with numl more when I am back to Nashville. 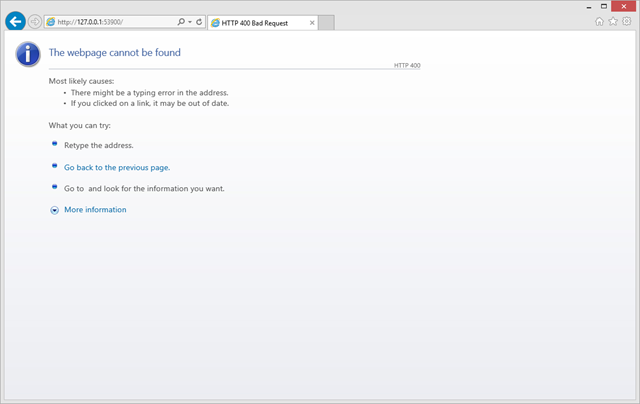 I never notice that IIS Express doesn’t listen to web requests other than localhost. So, to my surprise, when I try http://127.0.0.1, I got HTTP 400, Bad Request instead. Change 127.0.0.1 to localhost and everything is fine. Anyway, you can set your IIS Express to let it listen to a request for 127.0.0.1 easily. 1. Look for a file applicationhost.config. It’d be under /documents/IISExpress/config. 2. Go to <sites> section and look for your site. In this example, I have my web project named MyWeb. 4. Stop IIS Express and run your web site again. Now you should be able to access your web site thru 127.0.0.1 address now! Since I have experienced the same error more than three times while creating Windows Service (.NET 3.5) on Visual Studio 2012 and/or 2013, I think I should post a solution here for my quick reference. If you create a Windows Service and target .NET 3.5 on Visual Studio 2012 or 2013, you might experience the error message while compiling the project. Could not run the “GenerateResource” task because MSBuild could not create or connect to a task host with runtime “CLR2” and architecture “x86”. Please ensure that (1) the requested runtime and/or architecture are available on the machine, and (2) that the required executable “C:\Program Files (x86)\MSBuild\12.0\bin\MSBuildTaskHost.exe” exists and can be run. And that should resolve the issue, everything should be compiled. 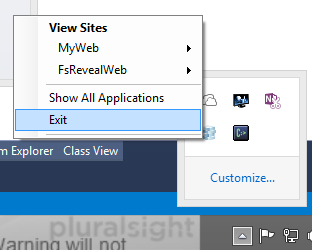 However, if you still have to support IE8, unfortunately, it doesn’t support map function. To make IE8 supports the map function, you can add a Polyfill that you can find on this page. Or if you use either jQuery or Lo-Dash, you can use jQuery.map or _.map as well. Lately, I have been trying to learn more about Data Science and Machine Learning. Following a coursera’s machine learning class and reading some books like, Data Science for Business and Mining the Social Web is very useful. However, you may want to get your hands dirty and learn the topics by solving the real-world problems. Fortunately, there is a site called Kaggle which provides data and problems for you to solve. Basically, Kaggle is a platform allowing companies and researchers to post their data, so that people like data scientist, statisticians, data miners, and so on can compete to produce the best predictive models. Most competitions are real-world problems that big companies are trying to solve, and if you come up with the best model, you could win some prizes or even get a job! For a newbie like me, Kaggle also has 101-type competitions that could help you learn the basic while having fun solving the real-world problem. One of the problem that I am looking at is Facial Keypoints Detection which should also help me learn computer vision in addition to data science and machine learning. Many languages and environments like R, MATLAB, Octave, and Python are generally used in Data Science and Machine Learning fields. However, F# is also a great language for data-oriented problem-solving, data science, and machine learning tasks as well. 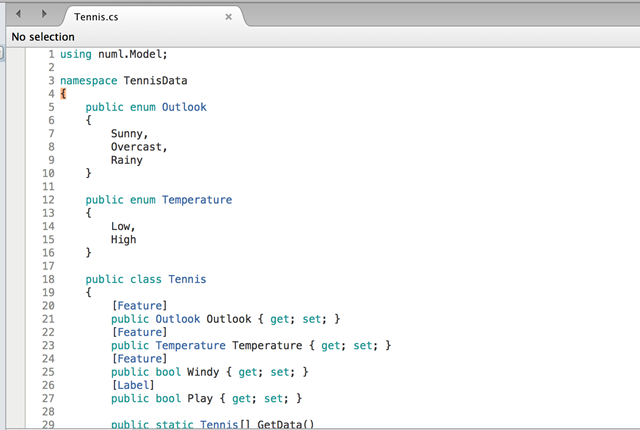 REPL and succinctness of F# allows you to explore and manipulate the data in both functional and imperative styles. With type providers, acquiring data from various sources like CSV, XML, JSON, and databases as well as interoperability with R can be done within F#. In addition, there are libraries like Deedle and FSharp.Charting that will be very useful. 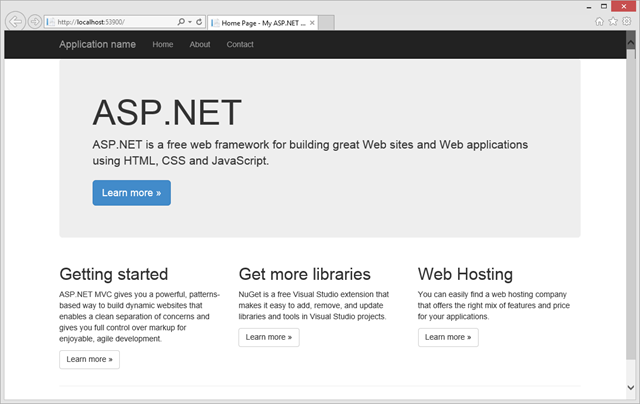 And as F# is a .NET languages, you can use .NET libraries like Math.NET and numl to help as well. 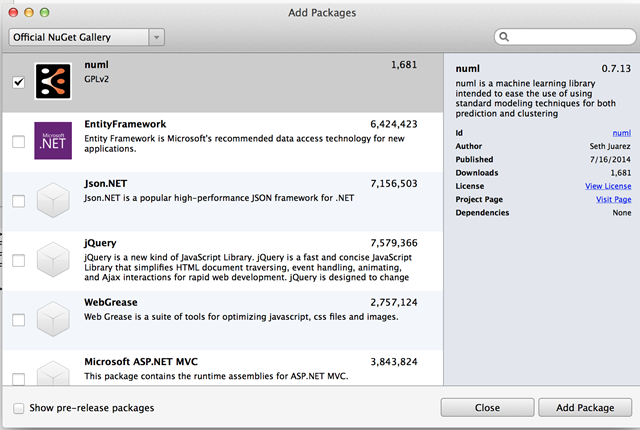 To get start quickly, we can just install the FsLab NuGet package that put together useful F# libraries for Data Science task. NOTE: As of 4/26/2014, FsLab is still beta, so you have to select “Include Prerelease” option. 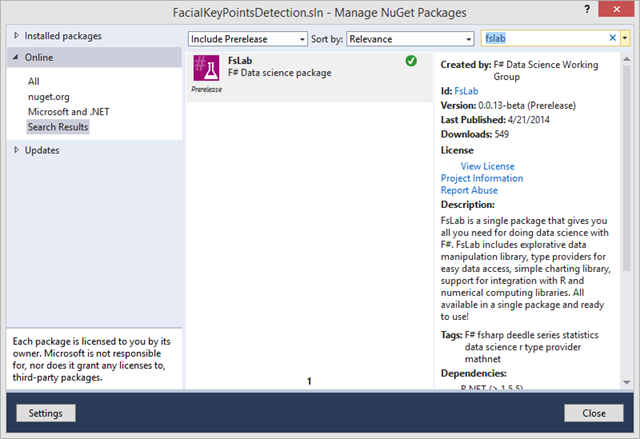 This post, I will show how we can use F# and R Provider with the Facial Keypoints Detection. I won’t try to solve the problem yet :-), but I will follow the R tutorial that let me learn R as well as getting familiar with the data. The first step is to download the training data from here. The training file is in csv format with 7049 rows and has 31 columns, 30 of those columns keep 15 (x,y) keypoints such as nose tip, left eye, etc. The last column is a list of pixels representing a 96×96 image. I want to use my own type, so I just create a Face type and write a simple parser in F#. LeftEyeCenter = toXy r. r.
RightEyeCenter = toXy r. r.
LeftEyeInnerCorner = toXy r. r.
LeftEyeOuterCorner = toXy r. r.
RightEyeInnerCorner = toXy r. r.
RightEyeOuterCorner = toXy r. r.
LeftEyeBrowInnerEnd = toXy r. r.
LeftEyeBrowOuterEnd = toXy r. r.
RightEyeBrowInnerEnd = toXy r. r.
RighttEyeBrowOuterEnd = toXy r. r.
NoseTip = toXy r. r.
MouthLeftCorner = toXy r. r.
MouthRightCorner = toXy r. r.
MouthCenterTopLip = toXy r. r.
MouthCenterBottomLip = toXy r. r.
If you want you can use CSV Type Provider, but you should specify the InferRows to be zero to check the whole file and set PreferOptionals to be true to use Options type. 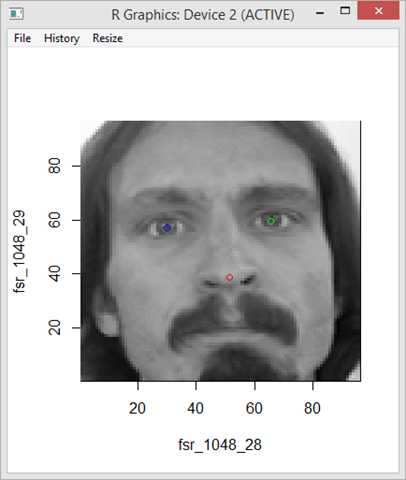 After we get all training data, the first thing is to visualize the face data. 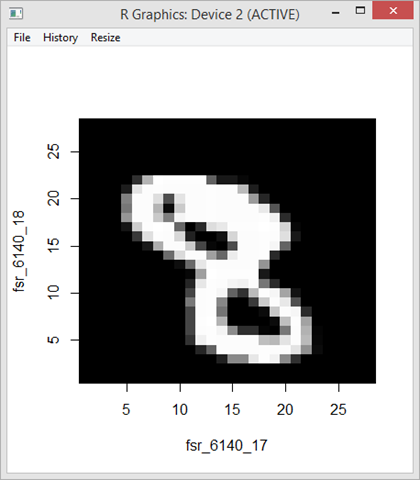 R already has nice graphics library that we can use to display the image, so we can use R Provider to call those functions from F#. Let’s get values from the first face data. Now we have all values, we can put them in a format that R expects and call the R functions. And you should see the sample image. Although, you should be able to call R functions directly from F#, sometimes trying to figure out R format can be cumbersome. What we can do is to use REngine.Evaluate like this as well. Now since I know how to use R to display gray-scale image, I can use the same trick to display the image for Digit-Recognizer data :-). You should see the power of F# which allows us to process and manipulate data with F# and utilize R for statistical computing and graphics! In the future post, I plan to share more about my journey with Data Science and Machine Learning in F#. Happy data mining! In the last post, we talked about techniques to implement tail-recursion in F#. We also learned that to write pure functional code we can only use immutable data structures which means we have to implement loop using recursion. Writing recursive function can be cumbersome (e.g., the function has to have one or more base cases) and hard to understand. It’s also harder to make sure that your recursive function is a tail-recursive one. Fortunately, using higher-order function and data structure like list (which is a recursive data structure) can help easing the pain. Let’s look at our non-tail-recursive factorial function from last post again. Since the function basically multiplies numbers (e.g., x, x-1, x-2, …) together, we can actually think of the input as a list of numbers like [5,4,3,2,1] instead. With that in mind, we can now implement factorial function using List functions like List.fold. A function that takes ‘State which we can think of it as an accumulator, ‘T which in this case is each value in the list, and returns new accumulator. An initial state of an accumulator. The last ‘State is the final out put that we want. Now, let’s see how we can implement our factorial function with only one line of code :-). The most important part is the lambda expression, (fun acc i -> acc * i), that we pass to the fold function. The acc parameter in the lambda expression is the accumulated result like the acc parameter in accTailRecursiveFactorial recursive function from the last post. Using fold also gives us tail recursive function. Here is the IL generated by foldFactorial function. If you are curious, below is what List.fold looks like (NOTE: The code below is from list.fs in F# compiler and code library on GitHub). You probably notice that it has the nested recursive function that is tail-recursive! And as a bonus, you can even make the factorial code shorter by using operator (*) which is actually a normal function in F#. Better yet, the code can be made shorter by using List.reduce which is a specialized version of fold that treat the first input on the list as accumulator. This post shows how tail-recursive code could be implemented using List.fold and List.reduce. Since implementing recursive algorithm is important in functional programming, using built-in F# function like fold and reduce really reduces (no pun-intended 🙂 ) our work.